Only students who have submitted a complete application and have met the minimum requirements will be granted an audition for admission to the ChiArts Music Department. Please visit the application pages for more information. Students of all abilities and levels of experience may audition for admission into the music program. 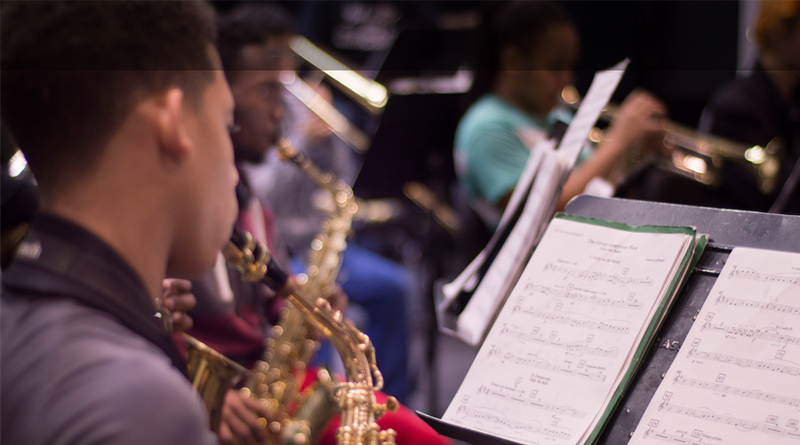 ChiArts recognizes the need to provide opportunities for students who have high levels of musical training and for students who have not had training in a formal setting, but demonstrate strong natural ability and a desire to learn. In order to place the students in the appropriate audition area, applicants must complete the arts experience section on the admission application that describes any prior musical training or experience. It is important for students to be thorough and accurate when submitting this information. Students must bring any instruments (except piano and percussion) to the audition. Double bass students who do not own their instrument should notify the ChiArts staff in advance of the audition. Perform two contrasting solos or etudes (fast/slow), or one solo or etude with contrasting sections. Accompaniment is not allowed for instrumental auditions; each student must bring one additional copy of music to the audition for the adjudicators. Percussionists: bring your own sticks, and prepare this music. Prepare two major scales of the student’s choice and the chromatic scale. In some cases, students may be asked to stay or return for additional evaluation. No additional preparation is necessary. Musical theatre applicants, please see the theatre requirements. 2 contrasting (fast/slow) songs. An accompanist will be provided (bring sheet music in the appropriate key), or students may bring accompaniment on CD, MP3 player, smartphone, or tablet. (instrumental track only, no lip-synching). Acapella (unaccompanied) singing is discouraged but permitted. Bring an additional copy of your music for the adjudicators. You should perform songs (no matter how simple) that demonstrate the quality of your voice and clear articulation of the song’s words. Patriotic songs, church hymns, some show tunes and art songs are appropriate. Popular music that imitates the style of a pop singer is not helpful in determining the quality of a young voice, and should be avoided. A piece that shows high notes and low notes is helpful. Students who are not sure about song choice should select from our preferred songs list, which you can view here. Many Chicago Public Libraries have sheet music available for free checkout. Singers will participate in vocal exercises and warm-ups with the adjudicators for the purpose of determining vocal range. The audition will also include time for the adjudicators to ask the students questions about their training and goals. Perform two contrasting (fast/slow) pieces, or one piece with contrasting sections. Accompaniment is not allowed for the instrumental audition. If using sheet music the student must bring one additional copy of music to the audition for the adjudicators. Percussionists: bring your own sticks, and prepare this music. 2 contrasting (fast/slow) songs. An accompanist will be provided (bring sheet music in the appropriate key), or students may bring accompaniment on CD, MP3 player, smartphone, or tablet. (instrumental track only, no lip-synching). Acapella (unaccompanied) singing is discouraged but permitted. Bring an additional copy of your music for the adjudicators. You should perform songs (no matter how simple) that demonstrate the quality of your voice and clear articulation of the song’s words. Patriotic songs, church hymns, some show tunes and art songs are appropriate. Popular music that imitates the style of a pop singer is not helpful in determining the quality of a young voice, and should be avoided. A piece that shows high notes and low notes is helpful. Students who are not sure about song choice should select from our preferred songs list, which you can view here. Many Chicago Public Libraries have sheet music available for free checkout.